This is the first contiguous, uniform 360-degree color panorama taken by the Imager for Mars Pathfinder (IMP) over the course of sols 8, 9, and 10. Different regions were imaged at different times over the three Martian days to acquire consistent lighting and shadow conditions for all areas of the panorama. At left is a lander petal and a metallic mast which is a portion of the low-gain antenna. On the horizon the double "Twin Peaks" are visible, about 1-2 kilometers away. The rock "Couch" is the dark, curved rock at right of Twin Peaks. Another lander petal is at left-center, showing the fully deployed forward ramp at far left, and rear ramp at right, which rover Sojourner used to descend to the surface of Mars on July 5. Immediately to the left of the rear ramp is the rock Barnacle Bill, which scientists found to be andesitic, possibly indicating that it is a volcanic rock (a true andesite) or a physical mixture of particles. Just beyond Barnacle Bill, rover tracks lead to Sojourner, shown using its Alpha Proton X-Ray Spectrometer (APXS) instrument to study the large rock Yogi. Yogi, low in quartz content, appears to be more primitive than Barnacle Bill, and appeared more like the common basalts found on Earth. The tracks and circular pattern in the soil leading up to Yogi were part of Sojourner's soil mechanics experiments, in which varying amounts of pressure were applied to the wheels in order to determine physical properties of the soil. During its traverse to Yogi the rover stirred the soil and exposed material from several centimeters in depth. During one of the turns to deploy Sojourner's Alpha Proton X-Ray Spectrometer, the wheels dug particularly deeply and exposed white material. Spectra of this white material show it is virtually identical to the rock Scooby Doo, and such white material may underlie much of the site. Deflated airbags are visible at the perimeter of all three lander petals. The IMP is a stereo imaging system with color capability provided by 24 selectable filters -- twelve filters per "eye." Its red, green, and blue filters were used to take this image. The IMP, in its fully deployed configuration, stands 1.8 meters above the Martian surface, and has a resolution of two millimeters at a range of two meters. Mars Pathfinder is the second in NASA's Discovery program of low-cost spacecraft with highly focused science goals. 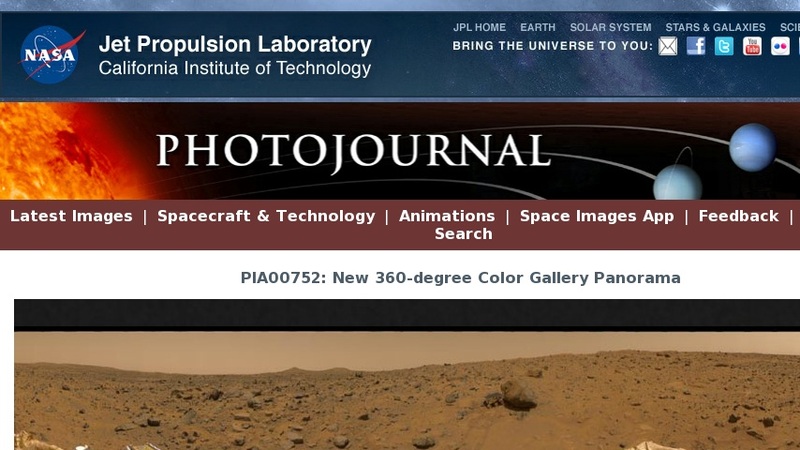 The Jet Propulsion Laboratory, Pasadena, CA, developed and manages the Mars Pathfinder mission for NASA's Office of Space Science, Washington, D.C. JPL is an operating division of the California Institute of Technology (Caltech). The Imager for Mars Pathfinder (IMP) was developed by the University of Arizona Lunar and Planetary Laboratory under contract to JPL. Peter Smith is the Principal Investigator.